A West Palm Beach, Florida transplant from New Jersey in 1948, Jack Morrow gravitated toward the local docks as a child and started cleaning boats for small change. His early passion evolved into a successful career that spanned more than 60 years and took him all over the world -- Australia, Venezuela, Panama, Mexico, the US Virgin Islands, Costa Rica, Dominican Republic and the U. S. East coast. Morrow's first job as captain was on the Valiant Lady in 1963. 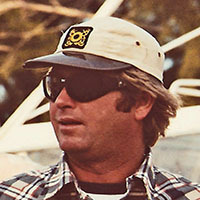 He was the first captain to win the International Masters Angling Tournament twice- in 1980 and 1982-- and he went on to score many top finishes in other contests. Career highlights include single-day catches of 54 sailfish on No Problem and 29 sailfish on Sail Ahoy in the waters off Palm Beach, Florida. Other memorable outings include an 823- pound blue marlin, a 1,025 pound bluefin tuna, and seven giant tuna caught in one day with IGFA Hall of Fame Member Johnny Morris on the Pretty Patti. Morrow has led clients to a number of world records, including an outstanding day aboard the One Bull in St. Thomas where they caught nine blue marlin- a record that held for over 15 years. Never forgetting his start in Palm Beach nor the many colleagues who helped him in his career, Morrow currently works as the captain of the Boys R Us for Greg Garvey-- alongside his son, Kevin, who serves as both his mate and stand-in captain.